Who is doing the most for world peace? Heads of state at the special summit on United Nations (UN) peacekeeping in New York last week seemed to compete with one another as they stepped behind the microphone and rattled off the figures of their peacekeeping contributions. ‘India has contributed 180 000 troops in 48 of the UN’s 69 peacekeeping missions. India’s commitment remains strong and will grow,’ said Indian Prime Minister Narendra Modi. ‘Italy is offering to contribute one infantry battalion, one helicopter battalion and one engineering battalion,’ pledged Italy’s Prime Minister Matteo Renzi at the summit, organised on the margins of the 70th UN General Assembly meetings. ‘Rwanda is ready to deploy an all-female police unit to meet the demand for more female peacekeepers,’ said Rwanda’s President Paul Kagame. From these speeches and the latest UN figures, it is clear that some countries, especially those in Africa, are doing more than their fair share in peacekeeping contributions. Small countries like Rwanda, Ghana or Tanzania send an extraordinary number of troops to conflict zones around the world, each contributing 5 685, 3 242 and 2 342 troops (including police) respectively. Ethiopia’s Prime Minister Hailemariam Desalegn and India’s Modi were amongst those that could hold their heads up high at the summit. 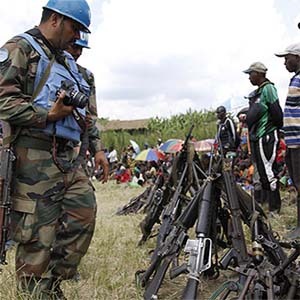 Ethiopia is the second largest troop-contributing country to UN peace missions with 8 309 soldiers, police and military experts on the ground. Bangladesh is the biggest, with a total of 9 432 and India has 7 794, according to the latest UN figures. At the meeting, UN Secretary-General Ban Ki-moon said a total of 125 000 troops, police and civilian personnel are deployed in UN missions worldwide. Yet this is still not enough. The summit, on 28 September, was called by United States (US) President Barack Obama to discuss ways to strengthen these peace operations and call upon the ‘collective responsibility’ of all countries to participate. Obama agreed that some countries carried a disproportionate share of the burden, and said a total of 30 000 new troops were pledged at the New York summit. Desalegn, for example, offered two more battalions from Ethiopia. This country has a huge number of troops outside its borders, including African missions like the African Union Mission in Somalia (AMISOM). ‘We are committed to do our share,’ said Desalegn, stating the obvious as he addressed the audience. Desalegn also noted that a number of African countries have pledged to increase their contributions to peacekeeping operations. Madagascar, for example, has pledged one battalion and one police unit, Cameroon has pledged two police units and a battalion, while Uganda also pledged two new battalions. African countries are increasingly willing to contribute to increase Africa’s capability for immediate response to crises and to react in the ‘difficult and complex security terrain,’ Desalegn said. Should the permanent members of the UN Security Council do more for peacekeeping? What about the big powers? The US contributes the most to UN peacekeeping, Obama said. This is true, but not in terms of boots on the ground. US contributions total 28% of the UN peacekeeping budget, but it has only 82 troops and advisors who are officially part of UN operations. Of course the US is engaged in many other places, with troops in Iraq and Afghanistan, battles over Syria, drones to spot terrorists in Mali and the training of Lake Chad Basin troops against Boko Haram. According to Russia’s President Vladimir Putin, aggressive US military action is one of the main reasons we need so many peacekeeping operations, but that is a debate for another day. Meanwhile, British Prime Minister David Cameron’s announcement at the summit – that Britain is sending troops to Somalia and South Sudan – is considered a first for the country. ‘The British presence in the region could be upscaled in the near future,’ predicts the Francophone, website Slate Afrique. Cameron announced that Britain is sending 70 troops to Somalia and between 250 and 300 to the UN mission in South Sudan – a drop in the ocean compared to what other countries are pledging. These pledges are in addition to the current 289 soldiers deployed by the UK. ‘These commitments [to peacekeeping] are not without risk [and] not without cost, but it is the right thing to do,’ said Cameron, adding that it is also in the national interest. The current migration crisis has, for example, shown that violence and instability in one corner of the globe can spill over and have an effect much further afield. Should the permanent members of the UN Security Council – the P5 – do more for peacekeeping? France’s President Francois Hollande certainly thinks so. Peace is the primary objective of the UN, and if it is not able to rapidly and efficiently deploy peacekeeping operations ‘the spirit of the UN itself will be undermined’, Hollande told heads of state. ‘We shouldn’t simply do more, we should do better.’ Since the P5 ultimately decide on the deployment of peace operations, they too should contribute, he said. On paper, France’s contribution to UN peacekeeping is also very small, with only 909 troops and personnel – most of them in Lebanon. However, joint operations with the UN in various parts of Africa has seen thousands of French troops on the ground. At one stage last year, French soldiers deployed in Mali – where they thwarted Islamist terror groups in the north of the country – and those in the Central African Republic totalled more than 5 000. Currently Operation Barkhane, based in Chad, is made up of 3 000 troops and personnel. Of the permanent members, China is now racing ahead after pledging an additional 8 000 troops at the summit. This is on top of the 3 079 troops already deployed, which includes those serving in the South Sudan mission. Russia, like the US, is however refraining from putting its sons and daughters on the front line, with only 79 Russians taking part in UN operations. Hollande, in his speech, added that France would like Africa to take greater charge of African conflicts. It is therefore training up to 20 000 African soldiers every year. African military experts will tell you that they are already doing that. In fact, the African Union (AU) feels it is doing more than its fair share and it is only right that the world also takes responsibility for crises like terrorism in Somalia. After all, it is a globalised world. And if you can’t send troops, send money. At the moment, the European Union almost singlehandedly finances the very costly AMISOM. However, earlier this year, it announced that others will have to step up to the plate and that it is going to reduce its contributions. ‘Where are the other countries who are also concerned? The Gulf States, Saudi Arabia?’ asked a European diplomat in Addis Ababa recently. ‘China is not contributing much either. They need to enlarge the circle of those paying for the AU to do the job,’ said the diplomat. The ideal for the AU would be a steady stream of funding from assessed contributions of all member states of the UN. China’s ambassador last month handed over a cheque of US$1.2 million to the AU Commissioner for Peace and Security Smaïl Chergui at a ceremony in Addis Ababa. The contribution pales in comparison to the nearly US$20 million per month that AMISOM costs, but it is a start.